What’s the process of writing a novel? What’s your writing process like? Do you follow a process when you write? Readers and other writers often ask me about my writing process, and my answer never makes any sense. Usually because I invent it on the spot to camouflage the fact that I have no process — it’s more like “utter randomness” based on stuff like which planets are rising in the house of whatever and what’s playing on iTunes and what kind of incense is burning and whether there’s any dark chocolate in the vicinity. Now that I’m fully enmeshed in the writing of a third book, I’m getting better at this whole “writing process” thing (at least, as of last night, when I completed this particular process) and can actually articulate something about it — specifically, the time-tested index card method. But first, a process history for comparison’s sake. It took me almost 4 years to write TWENTY BOY SUMMER. In the beginning, I sat down with an idea and some themes that I wanted to explore, and over dozens of workshops and critique sessions and retreats, I developed the book, 1 non-consecutive chapter at a time, with lots of feedback and do-overs and surprises. Once I finished, I hired someone to help me revise and fine-tune until it was 100% flawless and complete (ha! ), then secured an agent. Together, my agent and I spent time revising and fine-tuning until I was certain it was 100% flawless and complete again, then we sold the book and went through another revising process with my editor before sending it off into the world (and now I know that nothing is ever 100% flawless and complete). With FIXING DELILAH HANNAFORD, there was this crazy new thing called… *cue ominous music*… a deadline (flexible, but still a deadline). First, I worked with my agent to sculpt my loose ideas into something tangible, cementing it during a Lighthouse writing retreat weekend. Now, because I had to write a full synopsis for my editor, I had to figure out the ending before I even wrote the beginning. Yikes! Somehow, I got through it, and spent just over a year crafting the story, mostly in consecutive chapters, using the synopsis as a guide. I had some feedback from early readers and again went through a round of revisions with my agent, but we knew Delilah would require a more intense editorial revision since my editor would be involved at an earlier stage of development and I didn’t have 4 years to work on it. So… I’m currently revising with my editor and will likely go through a few more back-and-forths before it’s officially ready. This time, I had a pretty solid picture of the full story arch, so I thought I’d try the formal outline method. After getting positive feedback from my agent on my idea, I outlined it and wrote a full synopsis and a few chapters. 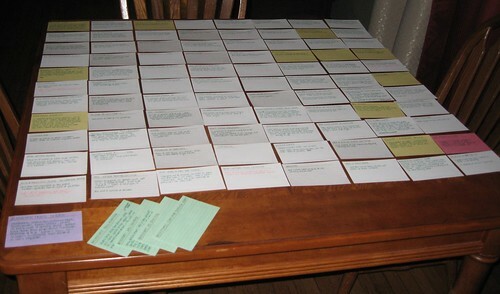 Then, last night, I did a complete, scene-by-scene outline with paper index cards, spreading them all out on the table and rearranging them again and again until the story started to make sense. See? The yellow cards represent points in the story where things take a new direction, like conflict and reversal and crisis points. The white cards represent actual scenes with scene notes. Each one is titled and many of them have bullets or notes to build from later. The green cards are backstory details that need to be added in throughout, and the purple card is a list of the main character’s traits and qualities to keep in mind when writing each scene. From here, I added and removed and shuffled cards until I felt that every major scene was accounted for and the pacing was right. Satisfied with the resulting gigantic stack, I transcribed all of the cards into their digital counterparts in my writing software, Scrivener (Mac-lovin’ writers, if you haven’t heard of this awesome tool, what are you waiting for?). Now I have the digital version of the cards from the dining table set up on my computer. From this skeleton of notes, I can flesh out each scene, still adding and changing and rearranging as I go. So writers, tell me… what’s your writing process? 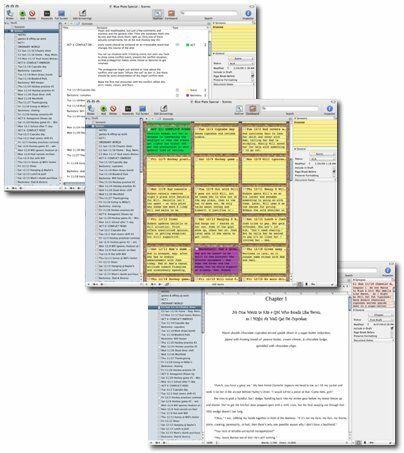 OKAY I HAVE TO ASK… BECAUSE I HAVE BEEN TRYING TO FIGURE THIS OUT FOREVER… HOW DO YOU GET THE INDEX CARDS DIFFERENT COLORS IN SCRIVENER????? It looks like you have figured out way more awesome Scrivener stuff than I have. Also: my writing process? um…. I used to have no process, which is kind of why I have like 5k-10k of a zillion different novels lying around. But now I at least do character sketches and have ideas (in my mind, only my mind, nowhere concrete) of a few pivotal scenes. And I know how long I want each chapter to be. And sometimes how it will end. And I run with that. This novel is going way faster than my past… *refuses to say how many*, but that might just be because I had the summer to work on it. PS again. Scrivener is so win. 2) As you’re working on each file or chapter in your draft, you have an option of assigning it a label, like chapter, scene, concept, etc. You can assign colors to each label. I think some came as the default settings and I customized the rest. Anyway, to add more labels and add/change their color, you can go from the top menu to File > Label & Status Setup. This will give you the option of adding/customizing labels and colors. Then, when you apply the labels to your files, your index cards will appear the color of your label (as long as you’ve followed step 1). Let me know if this works! Oh, and if you haven’t already, walk through the tutorial that came with it. It might have some good pointers, too. No cards. No outlines. Few notes. Only if I’m afraid I’ll forget something important. Seat of the pants. That’s it for me. Start with characters. Create those well, and usually only in my head, although it’s a several month process. Then I let them talk to me. Probably why I’m not writing mysteries. This is EXACTLY my writing style! Except I am writing mysteries/thrillers! D’oh! I sometimes go that route, but have a harder time meeting deadlines. That’s kind of how my first book went. That’s why I think – as much as I love the cards – each project is going to be different and might not work with the same structure. Wow. This looks very impressive. Oooh. Thanks for sharing. David Isaak from the Tomorrowville blog said once that he believes every novel takes it’s own process, which I believe is so true. I like to say that over the past few years I’ve developed a pretty good method – but every year (aka every novel) it seems to “develop” some more into something different. I have used index cards before, and loved them. I have outlined before, and not liked that so much. I have tried pantsing it, and that didn’t work great either. My best methods tend to be the ones where I come up with an exciting concept, write the first few chapters, and end up brainstorming the basis for the whole rest of my novel in those first few chapters. After that’s established, I settle into a write a little, brainstorm a lot routine. Out of any given week I’ll write maybe three times, and brainstorm incessantly. So yeah. What I get is a slow novel that is pretty well thought out and filled with invented-on-the-spot plot twists. Which is good…except it’s so slow! I would love to figure out how to speed up my process. Having readers seems to help. I hear you on that incessant brainstorming thing. I do that, too. I had readers for my first, but not as many or as often on my next. I’m hoping to have more readers for book 3. Scrivener! W00t!!! Every time I think that I have plumbed the depths of my love for it, I find yet more to love! I’m really liking the index cards outline! Keep up the great work! OMG. I love your index card layout. I’m seriously considering this for my current project. Usually I’m a heavy heavy outliner. My outlines run 25-30 pages and they are super duper specific. But this current book…it’s just not happily outlined. That doesn’t mean that it’s happily written. It’s just not happy. Maybe I need you to come over and help me make index cards? Feel like it? I’ll feed you! Will you house me, too? Then we might have a date. Writer’s retreat in BK! Woot! I think we should all go to Sarah Mac’s house and bring pot luck and sleeping bags so Sarah O. can teach us all how to use Scrivener. Name the date! That sounds awesome!